We’ve put together a series of short blog posts to help our candidates stand out during a recruitment process and land the perfect job. We hope you find them useful. Opening paragraph - ‘introduction’, ‘summary’ or ‘personal profile’. It’s a summary of your key skills, relevant to the job you are applying for, and should grab the reader’s attention – more on this in a moment. Key Achievements – specific examples or mini case studies summarising a select few relevant skills and experience, in slightly more detail. This may include some key facts and stats too. Employment history – dates, job titles, employer details in reverse chronology with a description of your role and key competencies and/or key achievements. Education and qualifications section (this can appear at the start, middle or end of the CV depending on what you deem the higher priority content in your CV). Hobbies and interests – an opportunity to get your personality across and show that you’re an interesting person. References – ‘upon request’ is fine, and contact details. The first thing to consider is that the person reading you CV probably has a stack of CVs and not a lot of time to read them. You should aim to grab their attention in the first few lines of your CV. Refer back to the job ad or job spec for the role that you are applying for and aim to summarise all of the key competencies required (or as many as you can fulfil) in the first few lines. That way the hiring manager will want to read on. In the sectors we cover, this usually means demonstrating experience of specific areas of the marketing mix, for example branding, website builds, OOH, DM, PR, events – you need to be explicit early on in your CV. Depending on the role, the same can be said about strategy, project management, stakeholder management and team management (including details team size), and perhaps budget size too. Industry sector experience can sometimes be important to a hiring manager, so it’s worth showing breadth of expertise, or highlighting relevant expertise in a given sector if that’s what you specialise in. Think about what the job ad requires and tailor accordingly. Softer skills like ‘working well as part of a team or on your own’ and ‘good attention to detail’ are perfectly valid attributes but they can seem a little generic and probably aren’t at the top of the hiring manager’s list when shortlisting. Include them if you wish, but don’t let them overshadow the more valuable experience listed above. If you work in the marketing, creative or digital sector then you’re probably aware that on the whole, you’re dealing with a friendlier, less stuffy employer base than in certain other industries. For most of our clients, personality and cultural fit are very high up on their wish list. Writing in the third person generally doesn’t sound very personable, and it’s ok for your tone to be a little more conversational these days. Hiring managers (generally) appreciate a sprinkling of personality in a CV. As always there is a line though – keep it professional! Using strong and positive adjectives to describe yourself is fine, but many candidates make the mistake of overdoing it. Describing yourself as ‘exceptional’, ‘outstanding’ and a ‘true expert’ between just two full stops is probably overdoing it. It might also set you up for a fall at interview. Make sure you find the right balance. In a sector so driven by technology and with changing consumer behaviour and needs, chances are there is always going to be something for you to learn, so show you have your feet on the ground. ‘Expert’ implies you know everything and there’s always something to learn. Your CV should elaborate on the detail given in the opening paragraph, but without any unnecessary waffle. Remember it’s important to tailor your CV to the job requirements, so what’s relevant to one role might be completely irrelevant to the next. There’s no need to dilute your relevant experience with other stuff that could be toned down. Whilst we generally disagree that a CV should be no longer than 2 pages, only exceed the page count if what you have to say is of value. You can increase your chances of getting an interview for a role in a new industry sector by simply mentioning it in your opening paragraph. By demonstrating it’s a conscious decision to move sectors, and to state that you have a particular interest in that sector, is probably going to be music to a hiring manager’s ears. It also negates the assumption that you might be applying for hundreds of roles in any old sector without really thinking about your career. If you’re in marketing or digital then chances are stats are part and parcel of your day job. Your key achievements, or employment history will become much more tangible to the reader if you include facts and figures, budget info, team size, and anything else that adds context to your CV. This is the nitty gritty that can be written succinctly and will give the hiring manager the extra info needed to get you into the interview calendar. If photos aren’t your thing then it’s perfectly acceptable not to include one. 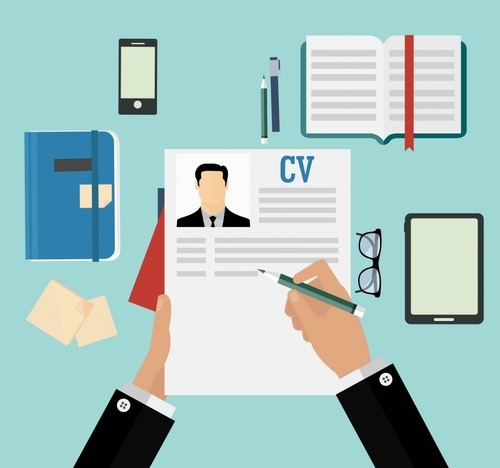 However, including a photo can help your CV stick in a person’s mind, and it can add a human touch to a fairly black and white document – think about Facebook and LinkedIn, the stats show that people are far less likely to connect with you if you don’t have a photo (an appropriate one). This isn’t as crucial with a CV, but it’s still a valid point. That said, a holiday selfie, a poorly cropped photo of you with your mates, or a snap of you holding a glass of wine on a Friday night are not very professional choices and could do more harm than good. Likewise a stern looking picture of you in your best interview clothing may have the same effect – you need to appear friendly as well as professional. Smile! It may sound awful, but a good CV should be easy to skim read and upon skim reading the hiring manager should be hooked and want to read every word. Formatting can help with this as much as the content itself. A CV that looks like a giant block of text is daunting to read. It’s impossible to skim read too. Think about spacing and use a mixture of punchy paragraphs and bullets. If you use graphic elements or infographics then ask yourself whether it makes the information in your CV easier to access. If not then don’t do it. Putting key words and phrases in bold can make it easier for the reader to skim the right info from your CV, but like many things, there is a delicate balance between overkill and being helpful. And going back to the 2-page CV myth, it’s better to have a well-spaced, easy to read CV which spills onto a third page, than it is to cram three columns of densely packed text into a tiny space using a ridiculous font size! We hope this helps you secure an interview for the job of your dreams! Click here for our next post on interview prep'.